A great deal of music has been written in the past which draws on nature for its inspiration. Beethoven, Haydn, Debussy, Mendelssohn, Vivaldi, and countless others have written works intended to evoke natural processes or picturesque landscapes. The tendency in the vast majority of these works is to idealize nature, to treat it as peaceful and beautiful. Anyone with first-hand experience and knowledge of nature, however, knows that this is a decidedly incomplete picture. Nature can be beautiful; but it is also a brutally powerful, frightening place where death is pervasive and constant. I believe that true respect and understanding of the natural world, and in fact, a real appreciation of its beauty, comes from a balanced view of its contents. As such, this darker, chaotic side of nature is what I am capturing in this work. The first movement, Blood, portrays the sense of constant motion, fear, and watchfulness that I imagine must be the daily condition of animals in the wild. Three contrasting sections vie for dominance of this movement, all embodying different forms of musical chaos either through constantly shifting metric patterns, perpetual glissandi, or micropolyphony, a technique pioneered by György Ligeti in which both pitch and rhythm are divided among different instruments such that all subdivisions thereof are present virtually all the time. The second movement evokes a complex group of feelings that I have experienced virtually any time I have slept in a tent while camping. The sound of wind through the forest at night has always thrilled me, bringing about feelings of fear, peace, excitement, and, most of all, a sense of my own smallness in comparison to the vastness of time and space in the natural world. The second movement is made up of several textural gestures that are reminiscent of wind and give a sense of smallness and ambiguity. These gesture shift gradually from one to another as the movement unfolds. 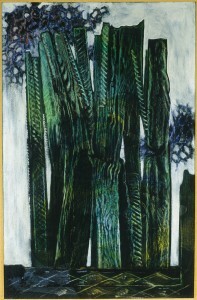 The title from this work is taken from a painting by Max Ernst in which he recalls his feelings of the “enchantment and terror” of the woods near his childhood home.